A car with a steady fuel leak isn't going to run for very long and it isn't going to be pretty when it burns to the ground. With that realization, I was more than happy to send my leaking fuel pump to Arthur Gould for a professional rebuild. I was happy that I did this for a few reasons. Gould's work is fast, efficient and relatively economical and I can rest easy knowing that a critical component on my car was rebuilt by someone who does fuel pump rebuilding as a living. Turnaround time was under three days and the $90 I spent was a wise investment considering a rebuild kit is over $45. As a bonus, the returned pump is absolutely gorgeous! It's amazing what a little bead blasting, new hardware and clear coating can do for looks. Gould reported back that my pump had two major flaws. 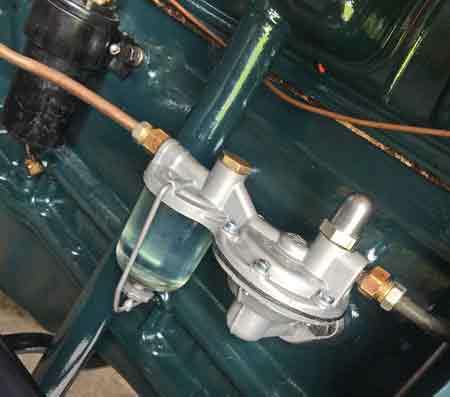 First, the diaphragm was stretched out allowing fuel to pass from the top chamber, through screw holes and into the body of the pump that is not supposed to see any fuel. Second, a portion of my pumps actuating foot was broken off. The broken piece held the return spring in place. While the foot would have probably worked ok, the return spring could have fallen out at some point rendering the pump inoperable. The solution was to find a new pump core and Gould had plenty to sell. My freshly rebuilt fuel pump. The new pump is installed and leak free. With the rebuilt pump in place (and installed properly), my Buick started again with no hesitation and the pump was leak free. As the car ran I began searching the rest of the engine for anything out of the ordinary and discovered fuel leaking out of the carburetor's fuel bowl and coolant leaking from hoses. 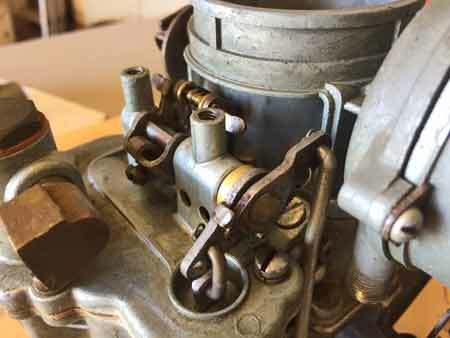 Hoping that the carburetor issue was just a few loose screws, I tightened the bowl cover and was disappointed when fuel still kept seeping out. To fix this fuel leak I had to remove the carburetor so I could resurface the bowl cover and the bowl itself. I resurfaced these faces by placing a fine grit sandpaper on glass and then working the pieces in an irregular pattern. Prior to sanding I used a Sharpie to mark the faces in various areas. When all of the Sharpie mark was removed I reassembled the carburetor. I should note that I used a new carburetor rebuild kit so I had completely fresh gaskets and components inside. With the refreshed carburetor back in place I finally had no fuel leaks from the tank to intake manifold. 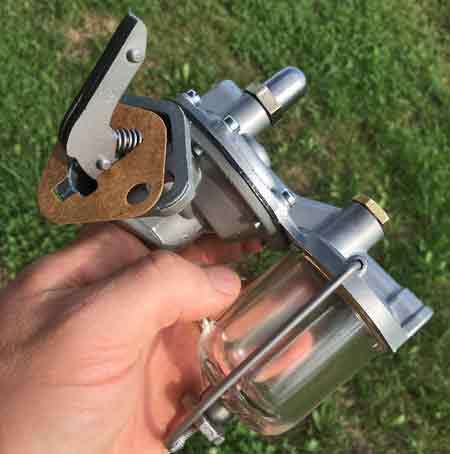 A close up of the assembled carburetor after float bowl & cover were resurfaced. My radiator hoses featured original style hose clamps with a Buick script engraved. To fix the coolant leak I tried simply tightening those clamps but the leak was persistent. When I installed modern hose clamps the leak disappeared so, at this time, those fancy Buick clamps have been relegated to the spare parts shelf. Once my engine was leak free it was finally time to have a little fun with the car. I started by running the car at a standstill at variable RPMs. This was fun for a little while but (naturally) before too long it was time to put the car in gear and drive it around. There was just one little thing preventing me from doing this and that was a lack of brakes! My wheel cylinders were still at Apple being sleeved and rebuilt but I figured nothing could possibly go wrong and pushed the car out into open air. Living next to a grass airfield has its advantages and wide open space was certainly one of them as I drove around slowly with no brakes. The sensation of pressing on the brake pedal with no response is interesting and before too long I smartened up and pushed the car back inside. About this time I remembered my new emergency/parking brake cables and quickly learned that the cables have a front and rear section — I had only had the rear section built so I was back on the phone with George Martin to order the front section. The emergency brake works quite simply. 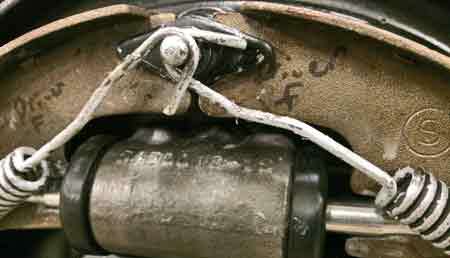 When a lever under the dash is pulled the front portion of the cable assembly pulls on the rear cables, actuating the brake. The front and rear section of the assembly meet in the middle of the frame where it is bolted to the rail. If the assembly is not bolted to the frame there is too much slack and the brakes won't be actuated when the lever is pulled. 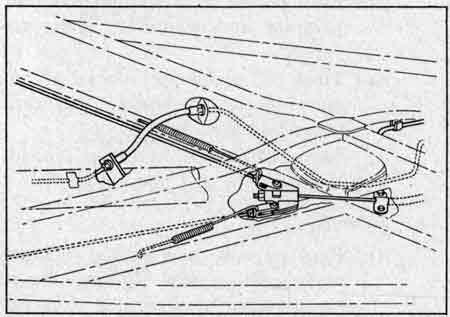 Diagram showing the parking brake installation. By the time I had the emergency brake system worked out my wheel cylinders came back from Apple. I chose to have them sleeved and fully rebuilt so I simply had to bolt them in place. When I reconnected and bled the lines I discovered a few leaks. While some of the leaks were due to loose connections, both of my rear lines were leaking at the wheel cylinders. 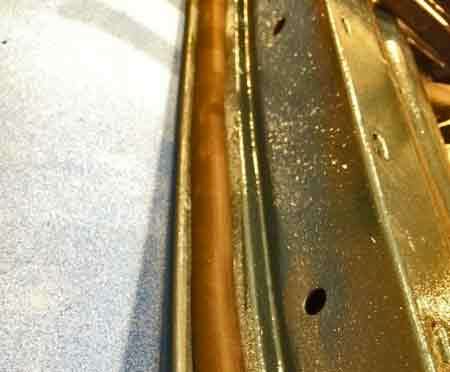 My flares looked ok but the fittings showed signs of corrosion. I made some new lines, repeated the bleeding procedure and (eventually) my brake system was leak free and provided great stopping power. Rebuilt wheel cylinders find their new home. In between the leaks and brake issues I installed the car's seats and added insulation to the rear deck area and inside of the roof. Dynamat will soon be installed under the floor mats, replacing the jute and fiberboard that was originally installed in 1937. I also turned my attention to reassembling my doors and this turned out to be quite a jigsaw puzzle for me! I disassembled the doors three years ago and took dozens of pictures and scribbled a few notes. Unfortunately, for reassembly, I needed even more pictures and better notes. Those pictures and notes couldn't be found in Buick's Shop Manual so I started experimenting with reassembly. What I should have done, especially as the librarian of the greatest automotive library in the world, was found another reference. Had I taken the time to flip through the Fisher Body Manual of Construction and Service I would have found the step by step instructions I needed. Alas, excitement got the best of me. Vent window channel, glass and regulator as one unit. Once this order is established, a door can be assembled in under one hour. If you don't know this order...well...it takes a little longer. 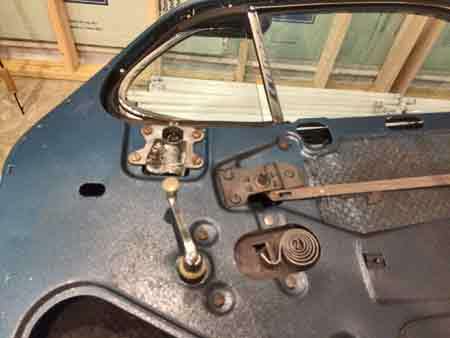 Behind the door panels you can see the window regulators and interior door handle regulator. New glass, fresh chrome and new vent weatherstrip makes a tight fit. The two door hinges are fastened to the body pillar in three places and the door itself in three places. 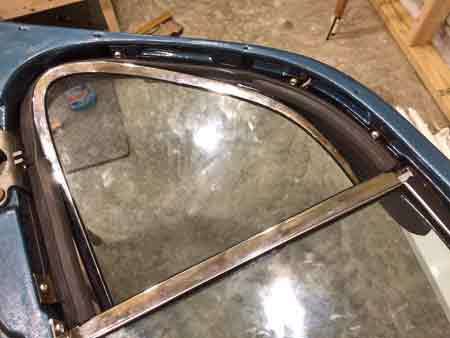 In addition a bumper stop travels from the forward body pillar into the cavity of the door. Both the latch receiver and hinges allow for adjustment to ensure a positive lock when the door is closed. Weather stripping then seals out extra noise and drafts, keeping the cabin comfortable and quiet. 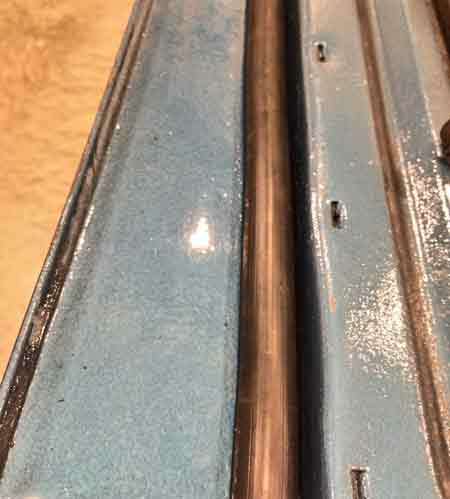 Close-up of the lower door weatherstrip. The clips squeeze the strip as it is pushed into the corresponding hole. The door's perimeter weather stripping is held in place with special clips. 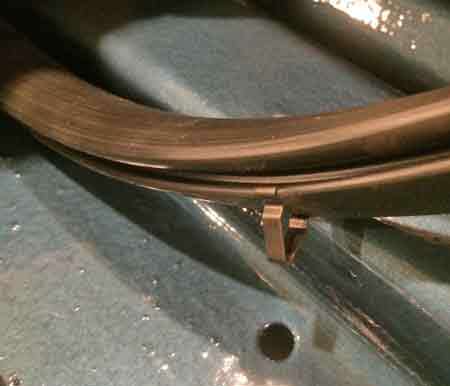 The weather strip on the bottom of the door is held in place with push clips that pinch the weather strip while the rest of the car's weather strip is held in place by different push clips that bite down. Installing these clips is straightforward but may cause sore fingertips! 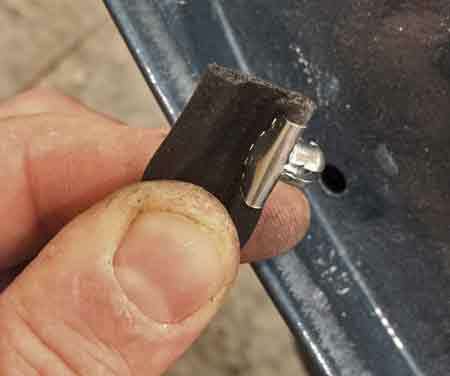 A closer look at the clips that hold the side & top weatherstripping. The newly installed passenger door. 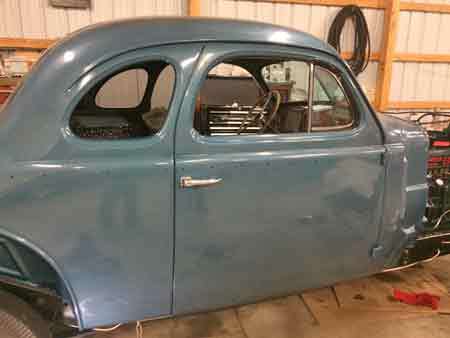 The next projects to tackle include the rear deck lid, completion of the interior, then fenders, lights and the hood. I plan to finish the car and have it licensed and on the road by May 1st. So far, I've run my Buick for 2-1/2 hours and I plan to make my first oil change soon. My engine temperature readings are perfect and my oil pressure sees 45 pounds at speed and 37 pounds at idle. While I've only driven my Buick in my yard and up and down the adjoining grass runway, I can tell you I am enjoying the ride and proud of the work I've done, even if it isn't perfect. Just recently my son Pierce got to sit on my lap and steer the Buick for the first time. The look on his face is priceless and the sound of his laughter is beautiful. He doesn't see any of the flaws I see, he doesn't care which parts are professionally restored and which parts daddy did. All he sees is a fun old car and he likes it. The old car hobby, through his eyes, is amazing. 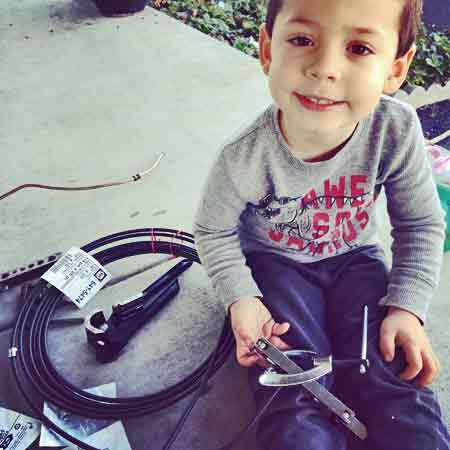 My son Pierce helps me bend and flare new rear brake lines.